In this DVD program, "So You Want To Own A Bird Dog", CJ Kausel shares with you his 25 years of experience of training, caring for and hunting over his own bird dog. Selecting a puppy, started or finished dog. Obedience training including the four most. Elements of yard and field training. When and how to use the "E" collar. This program is unique for CJ not only discusses the above subjects, but takes you right with him. You will be there to interview the breeder and witness the actual puppy selection process. He takes you through actual obedience, yard and field training exercises. You will see first aid administered in the field. 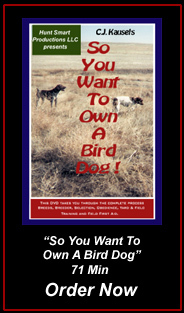 If you are an amateur "Do It Yourself" trainer or are interested in owning and training your own bird dog, this DVD is a must for your library.